'Spacious' was the word that kept coming to my mind during the week I spent camping in MSR's Hubba Hubba tent on a 50-mile Pacific Crest Trail hike. At 84 by 50 inches, the Hubba Hubba's floor dimensions may sound modest, but factor in the tent's unusually steep walls and high ceiling (thanks to non-traditional geometry) and you get a remarkable amount of usable space. Unlike most tents where you're always brushing up against the sides, the Hubba Hubba lets you and your gear sprawl out to your heart's desire, thanks to the innovative alignment of the tent's structural supports. In fact, the poles at the tent's head and foot actually form oblique angles at ground level—that is, they rise slightly beyond dead vertical. This bit of clever engineering actually makes it seem as if the tent is somehow larger on the inside than out. Faced with so much space (I was using the Hubba Hubba as a solo tent), I found myself thinking up ways to try to use it all. The obvious choice would be to bring a partner and share it. Thanks to dual doors and vestibules, you can put two people plus gear under cover without feeling cramped. Additionally, you get all this usable space for a modest four pounds, seven ounces (tent, poles, stakes, and stuff sack—measured). 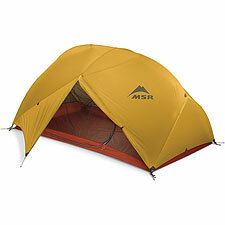 The MSR Hubba Hubba is a three-season shelter. The tent body is composed almost entirely of mesh, for ventilation, plus a completely waterproof rain fly. The tent floor, obviously, is a relatively sturdy waterproof coated nylon. This combination is especially suited for longish trips in uncertain weather, which is exactly why I picked it for my hike in the High Sierra. A separate rain fly gives you peace of mind in facing heavy (even sustained) rain, while allowing you to peel off the fly in favorable conditions and stargaze your way to sleep. Note however that an all-mesh body can work against you in high winds—especially in dusty or snowy conditions. Anticipating this issue, MSR has released a special foul weather version of the Hubba Hubba called the "HP". In the field, the Hubba Hubba is easy to set up once you've done it a few times. Unlike the normal twin poles crossed design, the Hubba Hubba uses only a single pole with forked ends across its long axis (plus a cross-pole to create awnings). The tent does require staking to holds its ends out—the single pole doesn't quite create enough force on its own to expand and hold the tent to its full size. The zippered doors form a horizontal rather than inverted U-Shape. I noticed this difference right away: it's not easy to unzip the doors with one hand, and the asymmetrical entryway was not quite where I expected it to be. For a while, I was puzzled by this design choice. Then I began to notice a few advantages: for one, when unzipped, the doors don't tend to flop into the dirt, helping keep interior dust and dirt to a minimum. Also, by only unzipping the bottom portion of the door, you can keep the doors effectively closed to bugs while still sticking your hands and feet outside to grab gear or put on or take off your boots. Night after night, I found the Hubba Hubba offered an exceptionally comfortable place to rest. Ventilation was excellent, allowing me to nap indoors in sunny weather if I choose, or seal everything up for a few extra degree's warmth on chilly nights. And I loved the extra headroom and space. At a minimum weight of four pounds, one ounces (w/o stakes), MSR's Hubba Hubba offers perhaps the best volume-to-weight ratio of any tent in its class. I wouldn't use the Hubba Hubba as my primary solo shelter (it's too big), but for two-man use, or whenever you need extra space and comfort plus the rain-worthiness of a double-wall shelter, this is an easy pick.